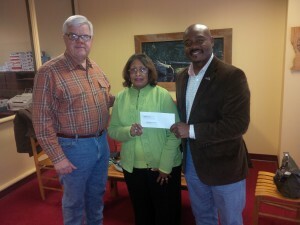 Barbara Moran of Shreveport, center, of Project Celebration, receives a $5,000 donation for the organization from Ron Smith Sr., right, of Central Louisiana Electric Co. Public Service Commissioner Foster Campbell, at left, encouraged CLECO to financially support Project Celebration and its work on behalf of victims of domestic abuse in Northwest Louisiana. The organization helps those affected by domestic violence in Caddo, Bossier, Webster, DeSoto, Natchitoches, Red River and Sabine parishes. Darren Olagues, president of CLECO Power, said the electric company was pleased to support the work of Project Celebration in assisting individuals and families in distress. “As we strengthen families, we better our communities,” Olagues said. Campbell is the author of a PSC rule waiving utility deposits for victims of domestic abuse seeking to establish a new home.